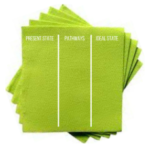 Starting your strategic plan on the back of a napkin. One day, 14 years ago, in a cafe in New York City, John Davidoff sat across from a corporate executive. John listened to the problems his client was having at his company, and began jotting down notes on his dinner napkin. While the two continued their conversation over coffee, this napkin became the foundation for his client’s strategic plan. Just a typical meal with John Davidoff. In our strategic planning work, Davidoff strategists lead clients through the ISAP process. Additionally, we engage external stakeholders so we have a well-rounded view of your organization. The result is a strategy that is both vision-oriented and serves as an operational roadmap for you to use to direct resources, programming, marketing, and staffing. A Mission-Driven Strategy re-aligns your organization and your culture towards growth and greatest impact. Ideal State Action Planning on a napkin is only a starting point. The process described here is a “light” version of Ideal State Action Planning (ISAP), a methodology Davidoff strategists use to facilitate informative and productive assessments of strategic challenges client organizations face. Think of an ISAP as an operational roadmap that poses powerful questions and leverages vision to move your organization towards its potential. Draw three columns. Label the column on the left Present State. The middle section, Pathways. The right column Ideal State. Select your focus point — an area of your organization or team you want to change for the better. Step 1: What is the Present State? Revenue is trending down 5% year-over-year. Clients are raising quality control issues. Step 2: What is Your Ideal State? What outcomes are being generated? How do team members work together? It is important your Ideal State is aligned with your mission. How will this new way of being or operating fulfill your organization’s “why”? Improving process or increasing effectiveness is not enough. Your organization has a better chance excelling with a defined purpose and future outcome; stretching beyond comfort, disrupting self-complacency and launching the organization towards its growth and potential. Step 3: What are the Pathways to Move from Present to the Ideal State? Now name the pathways to move from the Present to the Ideal State. Ask yourself what is needed to create the change you described. Is it more information, a new system, or better training? If your board is disengaged, do you have insight into their experiences? Do they feel aligned with your mission? If your customers are not being heard, do you need a new customer service feedback system? Identify and describe the pathways you will put into place to create the Ideal State. Applying Ideal State Action Planning to develop a Mission-Driven Strategy takes longer than a dinner date. It requires organizations’ commitment to fully understand the present state of a situation. And to develop a no-holds-barred an ideal state — thinking beyond what leadership, board, and staff previously thought possible. Armed with this vision, the organization can craft a responsive and actionable strategy. At Davidoff, we have a vast toolbox of approaches to move your organization and your leadership to the next level. To learn more, contact Jacki Davidoff.